Published in 1880-1, this three-volume edition of the extant works of the Greek mathematician Archimedes of Syracuse (c.287-c.212 BCE) was edited by the Danish philologist and historian Johan Ludvig Heiberg (1854-1928), whose Quaestiones Archimedeae (1879) is also reissued in this series. He later discovered a medieval palimpsest containing lost works by Archimedes, which significantly expanded the canon, but the present collection was produced long before this and therefore contains the works known at the time of publication. Heiberg consulted a Florentine codex, which he painstakingly compared with other sources to produce his edition. This second volume contains On Spirals, On the Equilibrium of Planes, The Sand Reckoner, The Quadrature of the Parabola, On Floating Bodies, the Liber Assumptorum (now thought to be apocryphal), the cattle problem and fragments. 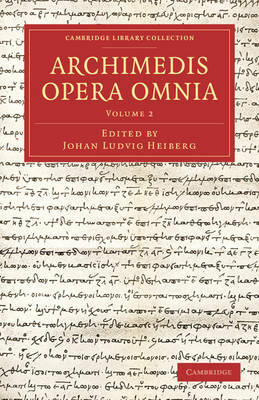 The texts are given in the original Greek with parallel Latin translation, notes and introductory material.